I don’t know what you think but when it comes to giving a photograph a title it can be something of a struggle. At best a title can enhance the image; at worst it can be bland and add nothing at all. Some are purely factual which can at least inform the viewer, but these lack any artistic merit. I have even read a few titles and to be perfectly frank they were a distraction and it would have been much better to have let the image stand on it’s own two feet. There are of course occasions when the photographer feels the need not just to give the photograph a title but also a very lengthy description, which somehow almost becomes more important than the image itself. All of this got me thinking, particularly as I have almost certainly been guilty of poor and uninspiring titles, overlong descriptions, the list goes on……. I can’t profess to be a great lover of poetry but I do see a definite connection between the art of photography and writing poems as a creative art. What if the two were combined? Well it’s hardly the most original idea but I thought I would give it a try. One of the simplest forms of poetry is Haiku, a Japanese poem of just seventeen syllables on three lines – five on the the first line, seven on the second and five on the last line. Traditionally the poem evokes images of the natural world. There is no requirement for rhyme and whilst the number of syllables on each line has changed over time I thought I would stick with the original guidelines. I like the minimalist approach and the strict parameters prevent verbosity – something I could be accused of in this post!! So below the photograph is my very first attempt at a Haiku verse combined with one of my ‘Chichester Harbour’ project images. ‘Lost glove’ is an apt, albeit unimaginative title, but I think the verse adds a little something extra. Masters of this form of poetry would probably mock the result, but I enjoyed linking words to an image. Will it be something I will use again? I can’t answer that but I’m pleased to have had a go. Your thoughts as always would be most welcome on both the image and the words! I love this! The haiku captures not only the subject of the image but the atmosphere too. The image itself is simultaneously peaceful and haunting, and I think it’s beautiful. Thank you so much for your appreciate comment. I have never tried Haiku before but the title ‘Lost Glove’ was so obvious and boring that I wanted to try another approach. Perhaps I should attempt to use Haiku for some of my other work?…..thanks again and so pleased you like the image. If you’re interested in the pairing of photography and Haiku I’d definitely recommend Michael Kenna’s book Forms of Japan – beautiful landscape images paired with fitting Haikus! Thanks Jay. I greatly admire Micael Kenna’s work and so have some of his books, although not the one you have mentioned. I’ll certainly take a look at it. Well done ! Your piece of Haiku sounds rather like some of the Japanese ones I’ve read. I’ve never tried writing Haiku, but I’ve certainly read many on various blogs I follow. I somehow imagine Haiku is not as easy as it looks. I have written poems though. 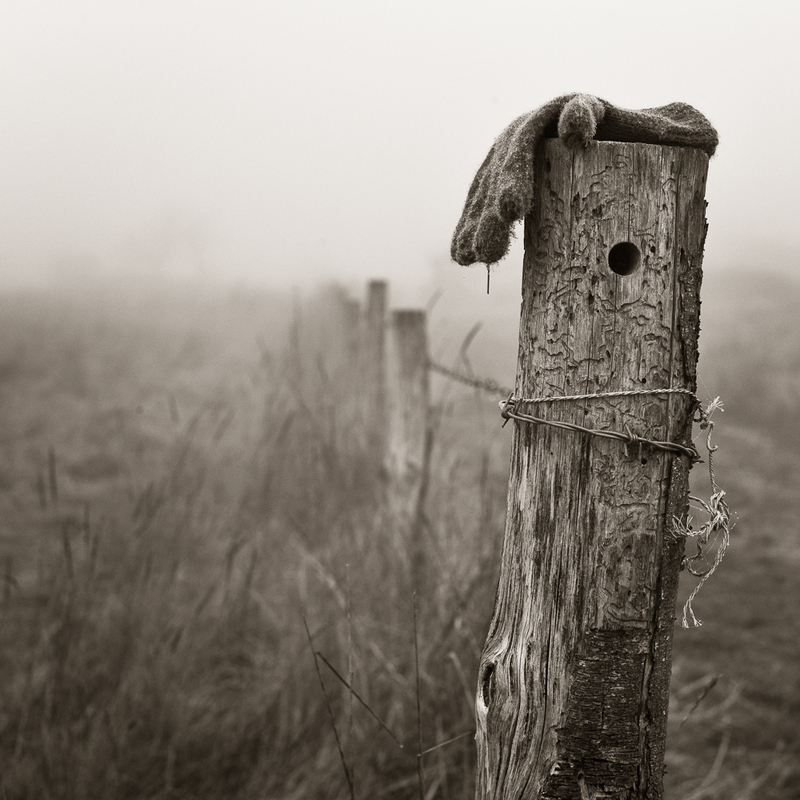 Love the subject of your image and the DOF as the mist fades into nothingness. Your images always inspire me to try harder to capture the essence or emotion of a scene and that’s a good thing. Some amateurs like myself give up when they can’t rise to the heights of Photographers they admire, but your images always make me want to ‘keep on keeping on’ (and practice more). Thanks Vicki. It’s one of those image where a bland title ‘Lost Glove’ somehow doesn’t do justice to the photograph. Whether Haiku will feature again I don’t know but I do like the idea. Pleased that my work inspires you; I know I take inspiration from many photographers whose work I admire. We all need something to aim for in life. Many thanks again. I have written a few haiku, but decided that, although I understand the idea of working in strict confines, I prefer to just write simple lines that “feel” to me like haiku. Not worrying so much about the architecture of the poem lets me free to say what is important to me. I can understand that, which may also be the reason that ‘modern’ Haiku no longer conforms to the strict 5/7/5 format. As I had never done it before I guess I had to start somewhere. It was a good haiku! The picture was well-taken and fills one with emotion to gaze upon the solitude implied by that lone glove. I think you ought to continue dabbling in poetry writing – you might just find you have a knack for it! Thank you Angela. My first attempt and I may well try some more Haiku in the future. I enjoyed your verse very much. Thanks for following.